It cannot be denied that there were a lot of controversies related to the pay scale of Indian Army after the 7th pay commission. In this article we are going to cover the complete details regarding their pay scale. 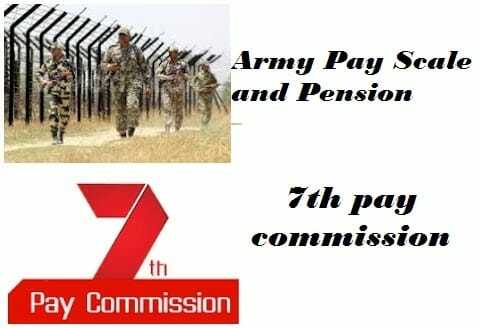 As we are aware that the 7th pay commission has restructured the pay scale format of the Indian army we shall sow you the current pay scale that incorporates all the allowances which are applicable for the defense personnel. In the memorandum stated by Defense personnel it was clear that the Defense services needs to stand fair among the comparison with what is being provided to Civil services, or else the Defense services shall deny their legitimate share of action. The pay levels have been distinguished in the pay matrix separately for both the Defense and Civil services and the Commission has taken up a complete different approach by merging the grade pay and also the pay bands within different pay levels. A stipend of Rs 21000 shall be provided to all the candidates every month and this comprises of the pay band of Rs 15600 and a grade pay of Rs 5400. With the successful completion of training, the candidates are offered the rank of Lt and they are entitled to get the same pay. The promotion from Lieutenant to the post of Lieutenant Colonel depends on a certain time basis. It is also based on a certain selection procedure that is subject to the completion of certain service conditions. But there are also considerations of the above mentioned pay scale. The grade pay system shall be abolished and in place of it, there will be the inclusion of 15 new scales that will be built. In these scales, the government shall pay dearness allowance, the house rent and also the travelling allowance with other facilities. According to the new reports, the 33 years retirement formula is already active and apart from that the employees on the retirement gratuity shall be offered with half of the sixteen months salary. After the services, employees are entitled to the full pension. The increment within pay scale for military personnel is 15-20% and also there have been announcements for the increment of basic pay, which will now be 15000 INR. Within the next two months, it will be finalized by the salary commission.